We Let the Ugly Ones Go! Yesterday was a beautiful day to go for a sail…We had a bucket list of things to do but guess what? All the stores are closed here on Sundays. With no outside distractions of work or shopping you pretty much had to make your own fun and then of course Sunday dinners were with the family no matter what. 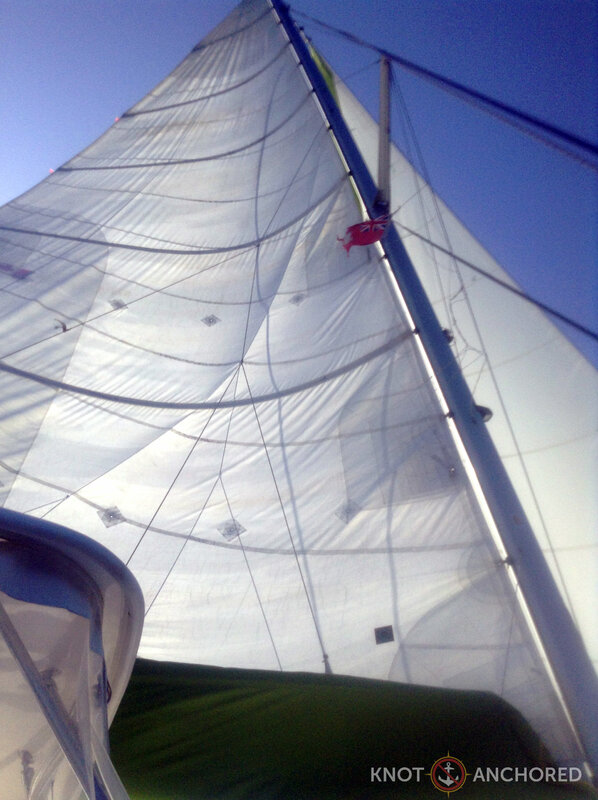 With our bucket list moved gently over to the Monday pile we decided a sail day was in order. You see since we got down to Grenada we have done much less cruising and much more anchoring. After all this is home during the hurricane season. Can’t go wandering around the ocean with the likes of Hurricane Erika and Tropical Storm Fred popping up here and there. Whilst sailing in no particular direction with no destination in mind we threw out a line to see if we could catch us some dinner. Well hello there Mr. Tuna we’ve been hoping you’d come by! They say fishing on long passages is a morale booster, everyone starts moving, adrenaline pumping – there’s a job to do! And we caught this ugly duckling. 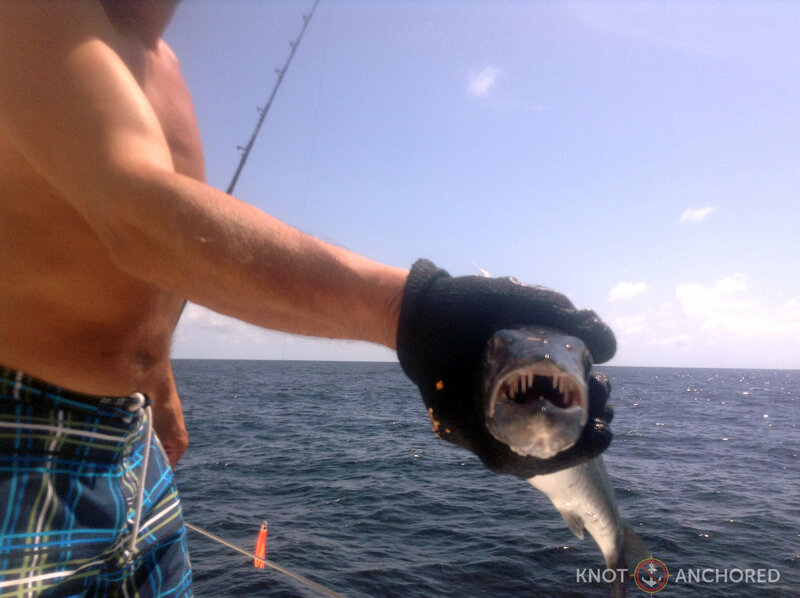 A barracuda, what a surprise – NOT. We are very talented barracuda catchers unfortunately. That said they DO eat them here and we have even ordered a plate of cuda in a local place. It was good, white, light meat. It may be because we can’t eat them in the Virgin Islands (some kind of disease they carry – ciguatera) and they can make you sick but we’re just not that into them! Going back to our spots on the boat, Stevo on the top deck, myself at the helm I noticed an unusual amount of fish activity around us. They were jumping all around, not flying fish, bigger ones you could tell by the splash. I was just about to say ‘Hey I think we might get something good out here’ and WHAMMO the line started to whirl and we were jumping to our command posts. This guy put up quite a fight, but we won! There’s a lot more to fishing than just reeling. For a tuna you have to move quickly, stun it, bleed it out and process. Messy yes but they don’t just appear on chipped ice in your local market magically. So worth it and so appreciated. 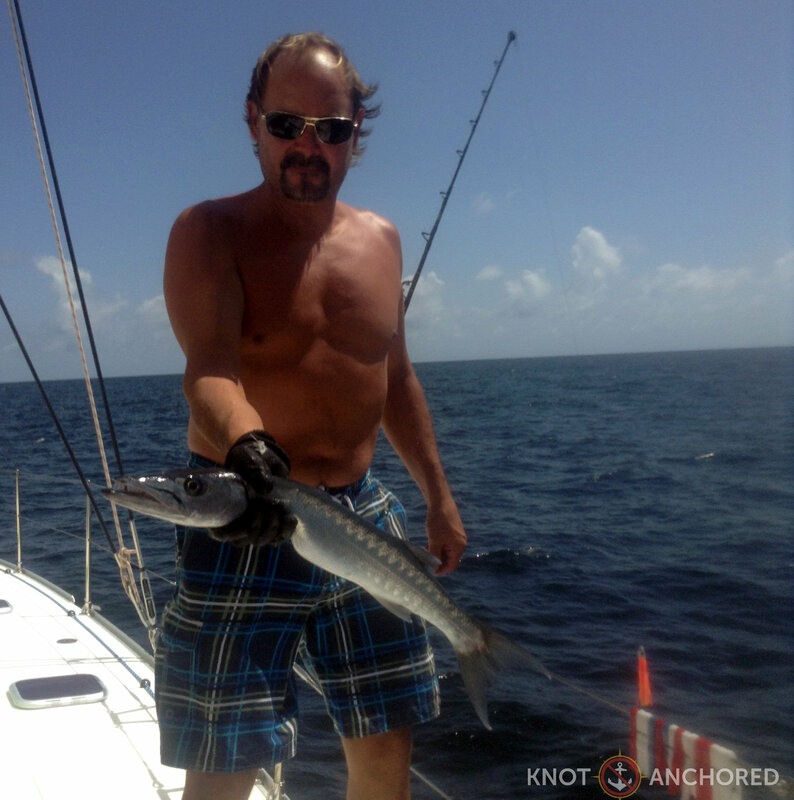 We catch yet another barracuda, just as ugly as the first and away he goes overboard. We’re thinking wow we just found the honey hole out here in 2,000 feet of water. Who KNOWS what we’ll catch out here. The line whirred, we got up. It stopped – immediately you sign it off as weeds. This is gonna be CRAZY! 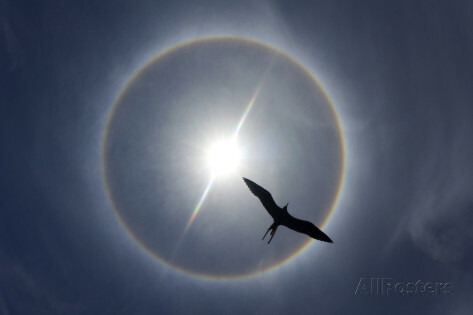 A bird that taken our bait and then become bait to something bigger because it was stripped right down to the guts. No need for pictures – your welcome! Birdy’s gone to a better place now. So we thought one, more, time. On our way back now and moving away from the honey hole. Thank you once again Mother Ocean for these gifts. (Sorry about the bird thing)! It was a magnificent feast and it will continue on today!